Odd request, but is anyone able to get me a chunk of a firewall? I keep chasing rust issues on mine, and it's now to the point that I had to cut out the rolled beads and the wheel well mount on the passenger side. If someone has a parts car with a decent firewall, and is willing to cut it up and sell it, we'll that would just be swell. Let me know. Thanks, guys. WOW. Your three days late. I just cut up a whole firewall with no rust except a in the wiper linkage area. I would have gladly given you a piece cut to specs with my plasma cutter. I have a serious issue with my firewall that I've been trying to fix. I've made a lot of progress, and have patched the hell out of the area, but I keep running into more issues. The problem is that the car was in a wreck at some point in it's life and the lower passenger firewall was damaged. The metal is weak and the shape is all wonky. I'm missing a good section of pinch-weld, too. 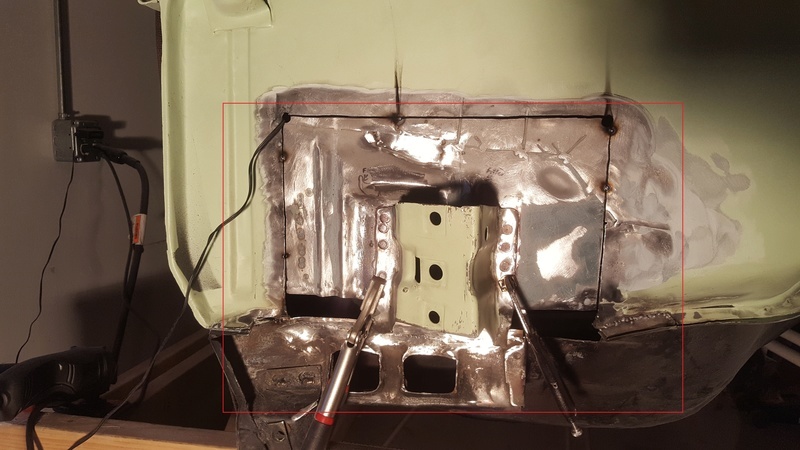 The lower firewall/floorboard area (black area with the two square holes) was pushed into the car in the accident. I've pulled it out a bit, but can't really get it into the correct shape. Ideally, I'd like to replace the area surrounding the inner fender bracket, and the panel that has the two square holes. If I get that entire section as one piece (with pinchwelds intact), then it would save me a bunch of time and energy. I've added a picture of the current state of the firewall, and circled the area I'd like to completely replace. It may be a stretch, but you might take a look at these guys. They might ne able to help with what you're looking for sir. Yeah, I've already got an email into them and dvap. No responses, yet. I'll give them a couple days and call. Great cond rust free firewall piece needed---237.17 shipped.pm me if interested.